I am going to apologize in advance for my relative brevity today, as it is technically John's turn to write. John is leaving on another trip this afternoon, this one to New Zealand. I promise to have a much more substantial post tomorrow. Last night's 10-0 win over the previously-surging Anaheim Angels was a strange win indeed. Carlos Silva compiled one of the most unorthodox lines you will ever see from a pitcher in a complete game shut out: 0 runs, 11 singles, 3 strikeouts, and most amazingly, 6 double plays. You read correctly--Carlos Silva recorded almost 50% of his outs through the double play. He was also only 3 hits shy of tying the record for most hits allowed in a complete game shutout. Somehow the Angels managed to go 11-33 in the game (that's a .333 batting average for you mathematically challenged) and not score a single run! Not one! I could hardly believe it myself as I watched. Carlos Silva has shown an amazing propensity for getting out of trouble this season. Obviously wins are an extremely deceiving statistic (for a number of reasons) but Silva has still pitched well enough to earn the 10 he has so far. He also has a better-than-league-average 4.23 ERA, which is even more impressive given the fact that opponents are hitting a ripe .312 against Silva this year. His whip is also 1.45, which is very high for a guy that walks just a batter and a half every nine innings. The thing is, Silva has done exactly what the Twins asked him to do at the onset of Spring Training. Terry Ryan saw in Silva a guy who would go out there every five days, throw strikes, get groundballs, and eat up innings. Isn't that really all you want from a number four starter? Silva's most impressive statistic, in my mind, is the number of innings he's pitched: 140.1. If Carlos makes his projected 33-35 starts this season, he is on pace to throw over 220 innings. 220 innings with a 4.23 ERA from your #4 guy? I think just about any contender in the league would take that (except for possibly the Athletics). The problem is, Silva is actually our third best starter right now. In an ideal world, Kyle Lohse would not be one of the worst starting pitchers in the league and pitching like Rich Robertson reincarnate; Silva would slip perfectly into the bullpen when playoffs roll around and everything would be hunky-dory. Unfortunately, right now Carlos Silva would be in line to start game #3 of the ALDS and I simply don't think he would stand a chance against a good hitting team come crunchtime. The Yankees will not strand 19 men on base, as the Angels did last night. And the Yankees will most certainly not go an entire game without and extra-base hit. 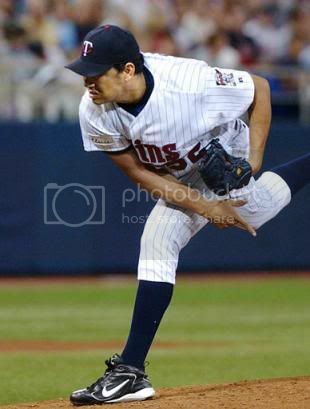 But for today, let us bask with Mr. Silva in the warm glow of his first career shutout (although perhaps in our celebrating we can leave out the throwing of baseballs into the upper deck). We'll worry about the playoffs when the time comes.